Last week I was in Ohio for work and it turned out being for a little fun too. On Tuesday, I was at Miami University for the first time in almost ten years. I grew up in Columbus and spent countless weekends in Goggin Arena at ice skating competitions or summer camps. I was even a second away from going there for undergrad. The campus looked great and I had to laugh… parking was so easy. You know you travel to a lot of college campuses when it makes your day to park right in front of the building your meeting is in, with no meters, no weird permits, no time restrictions, etc, etc! That night I drove onto Columbus and was able to spend the night with my mom. We split a bottle of wine and stayed up too late catching up. She’s super crafty (… like early Martha inspired crafty) and made Adam and I a cute Valentine. 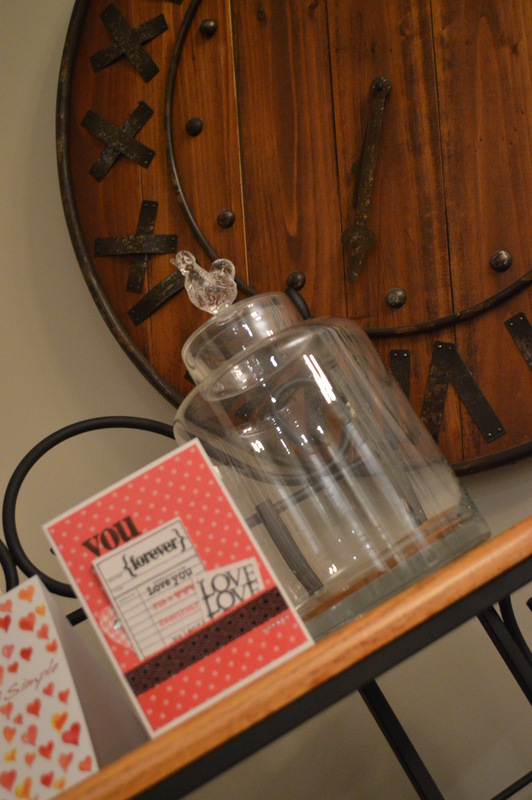 She also got me a perfect glass chicken container. I think she’s learning to embrace the chickens. Wednesday morning I had some meetings in the Union of Ohio State. I spend a lot of time in different Unions around the Midwest, and Ohio State’s might be one of my favorites. It’s brand spanking new, so that helps its cause, but the people who designed it really nailed it. It is such a spirited building. 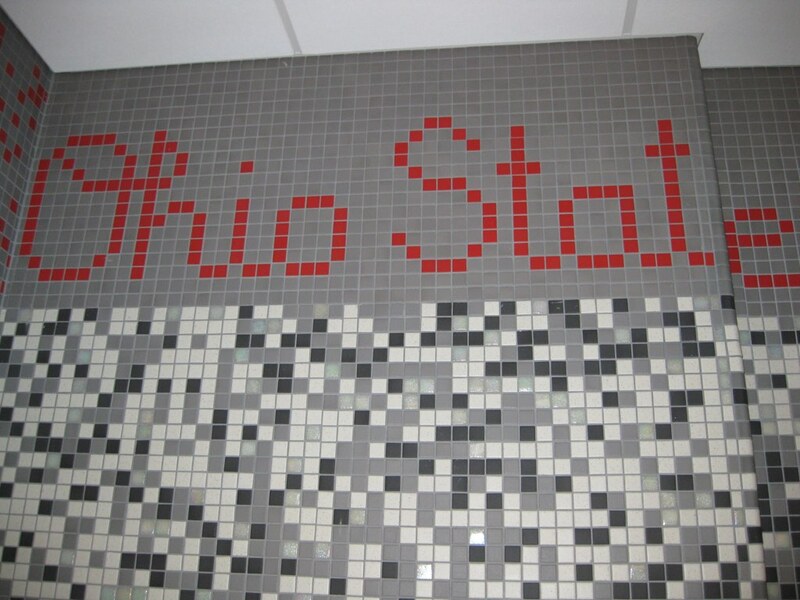 From the “OH” “IO” door knobs to the tremendously scarlet and grey tiled bathrooms; it’s a lot of fun. After my meetings, my good friend Laura met me for a quick lunch. Laura and I grew up together giggling on the neighborhood swim team and talking on the phone for hours about middle school crushes. She now lives near Columbus with her husband Jay while she finishes up Optometry school at the University. We still spend a lot of time chatting on the phone, but it was really nice to see her in person. Our conversation turned to Valentine’s Day plans. We both like to cook at home and have husbands who enjoy cooking as well, so we are often sharing recipes and “what we made.” It sounded like we both were going to have pretty low key nights. As I was about to hit the road that afternoon, I remembered a great boutique bakery, Pistacia Vera, where my mom used to get treats for special occasions. I could swing in there and pick up something to make our Valentine’s Day home date a little more special. I looked up their address on my phone and saw that they had two locations. Their stand alone shop, that I remembered visiting, and then a location in North Market, which is just down High Street from the University. 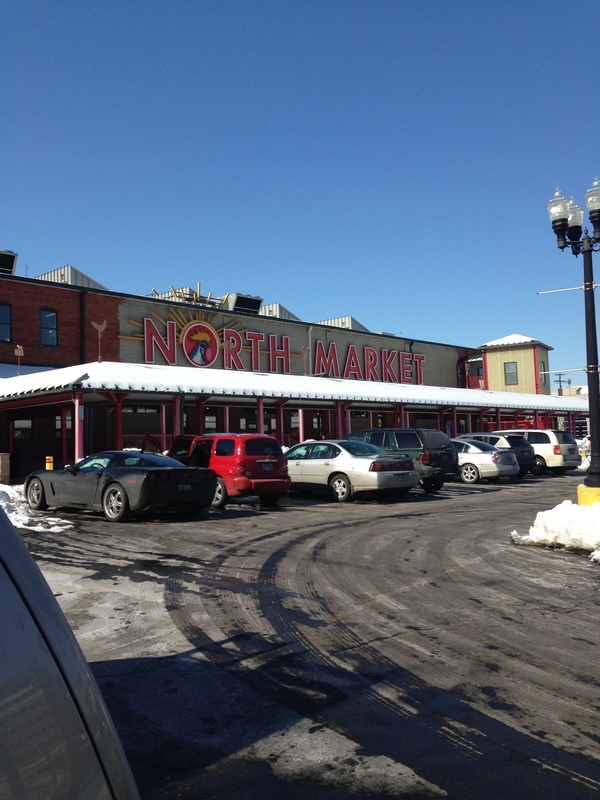 North Market is Columbus’ only true public market and is home to over thirty merchants. The products offered are mainly local, organic or artisan created. You can find anything from specialty coffees, grass fed meats, baked goods, flowers, and much more. I had not been to North Market in a while and had forgotten what a neat place it really is. I love the eclectic, yet down to earth energy it has. There were some people clearly doing their shopping and others just stopping in for lunch with their coworkers. I walked in with the plan to get a unique dessert, and walked out with a full, Ohio produced meal. A great wedge of Gouda at Curds and Whey. Curds and Whey had a huge selection of cheeses, caviar, and other little bites. I asked the cheese monger for the cheeses made in Ohio and he rattled off a few that were in the window, but mentioned that he had a wheel of local Gouda in the back. 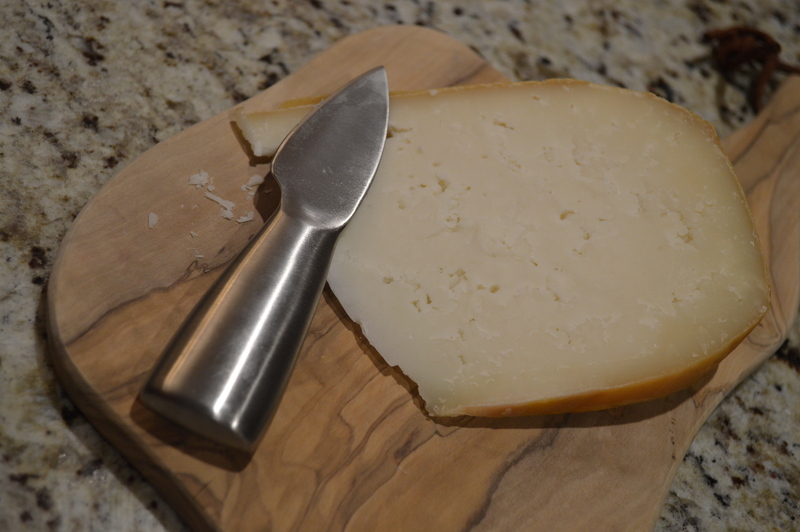 Now, just to be clear, I don’t play favorites with cheese… but, if I did, Gouda would be a contender. He asked if I wanted to try it. It was slightly soft, but still had a little bite with a salty, creamy taste. Winner. It was a great little appetizer for Valentine’s Day. 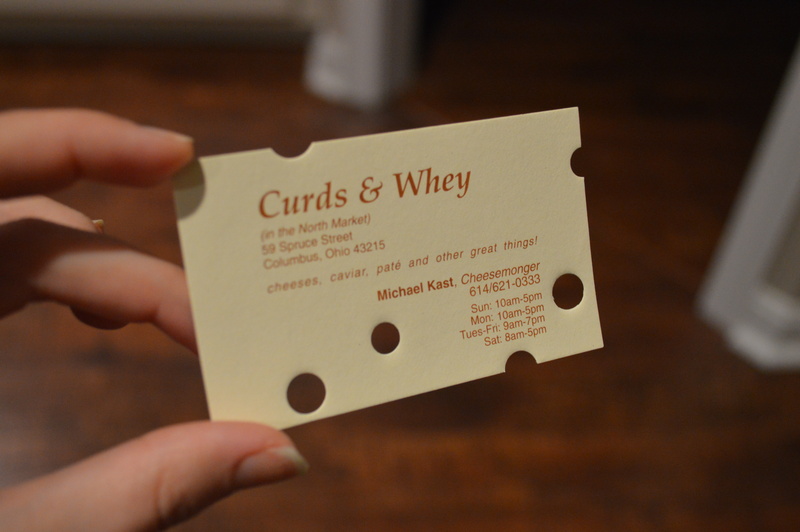 How cool is Curds and Whey’s card?! It’s like Swiss cheese! At The Barrel and Bottle I asked for Ohio wines. The selection of wine was small, but the sales clerk, who was in the midst of a sampling with a distributor, said they are all great and drinkable. She pointed out the bottles that were dry. There was a cabernet and a traminette that caught my eye. 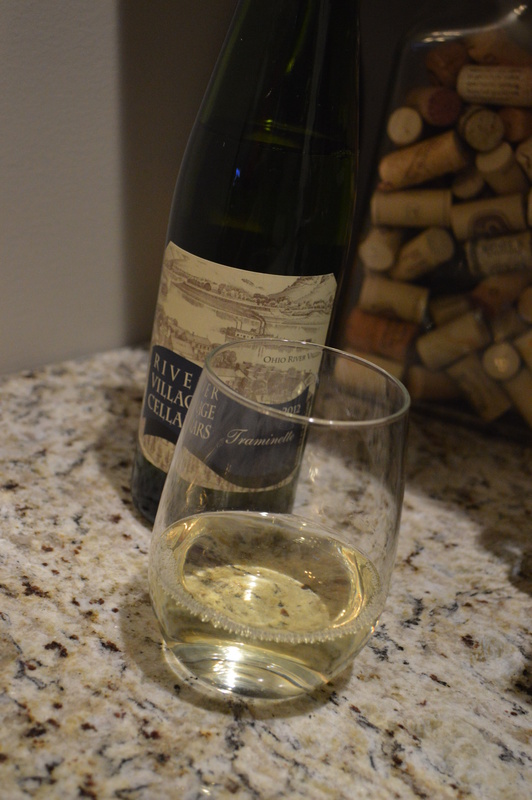 One of our favorite wineries in Indiana has a great treminette, so I gave it a go. Adam and I both loved how it complimented the Gouda and enjoyed it as we cooked our meal. Next, were some grass fed filets from Bluescreek Farms. Bluescreek Farms raises their meat in the Columbus area and does not add growth hormones or antibiotics. They carry beef, lamb, pork, goat and veal. They are also involved in some local CSA’s. Adam and I are both big fans of filet mignon so I went for the tenderloin filets. Adam prepared them with a little salt and pepper before we cooked them. They were tender and incredibly tasty. 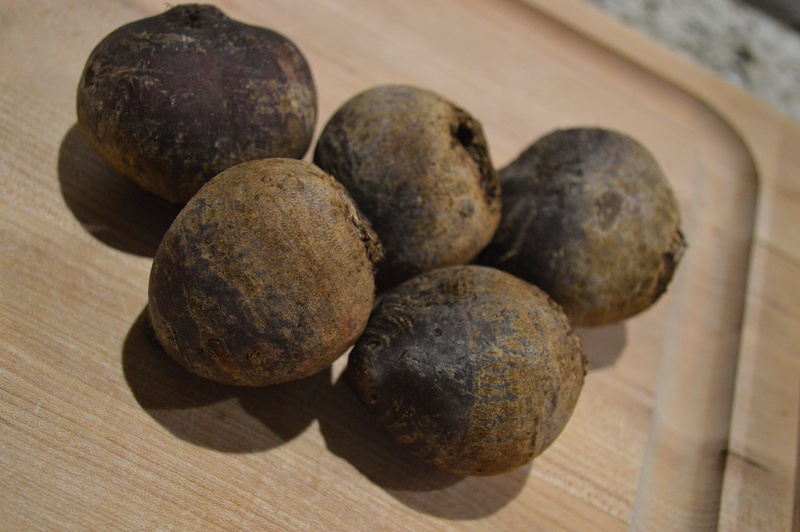 For a side, I picked up some beets from The Greener Grocer. The beets were from the county just south of where Columbus is located. They added the perfect shade of pink to our Valentine’s Day… not to mention, beets are rumored to be an aphrodisiac… it just seemed appropriate for Valentine’s Day. And, finally, the whole purpose of the trip… dessert! 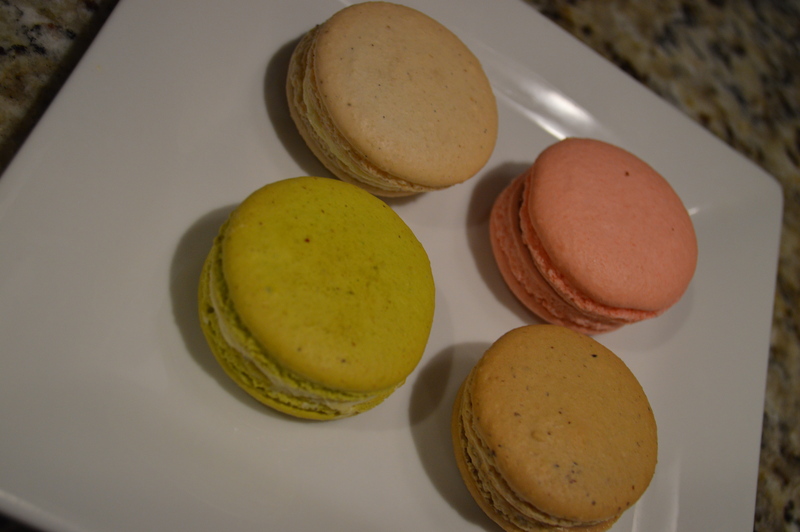 At Pistacia Vera I picked up four macarons, their signature treat, and a mini chocolate bombe. The bombe is a decadent mix of cake and mousse. My family has a regular (See also: large) one every Christmas… in fact, it’s so rich that one year it broke one of my parent’s Waterford cake knives in half! 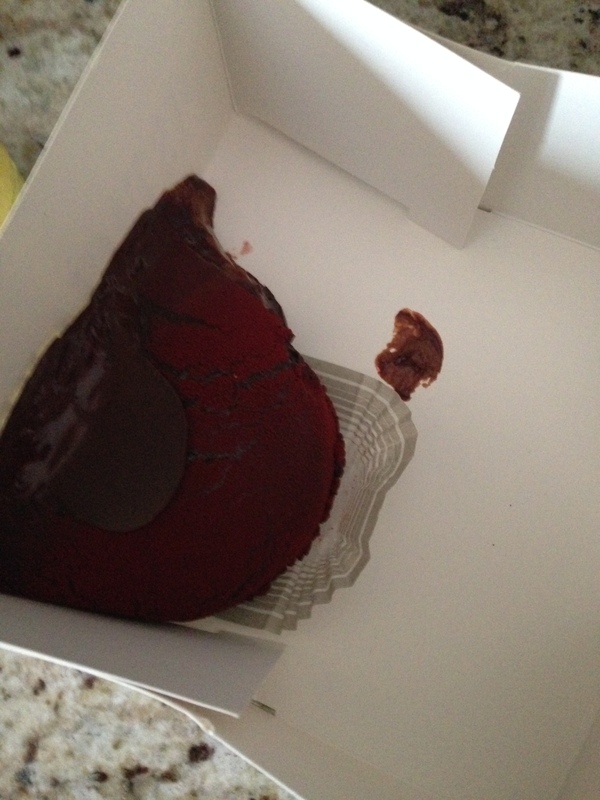 Unfortunately, the bombe had issues on the four hour drive back to our house in Indiana… it was more like chocolate soup. But, don’t worry, it still tasted great! These are so fun and colorful. I can’t wait to take Adam back to North Market. Maybe during the summer when they are host to a huge, outdoor Farmer’s Market. * with a validation stamp from a North Market Merchant… So, buy something! You’ll love it! Ice Cream and Me… “Mint” to Be. Fun Fact #1: July is National Ice Cream Month. Fun Fact #2: Indiana is the #2 producer of regular and low fat ice creams in the Nation. Fun Fact #3: I love making (… and eating) ice cream. Adam and I received an ice cream maker for our wedding from my cousin. It wasn’t on the registry and it was one of those small appliances I wondered if I would ever use. My mom made ice cream from time to time growing up but, I had never given it a try. I was entertaining taking it back, but something told me just to open the box and take a look at it. I now joke that ice cream brought me to life. … But, there is a little truth to this. The summer after Adam and I got married there were changes with my role across the nation and because I was not in the position to move, I had to walk away from the company. And work all together. Jobs in my field and skill-set were nonexistent within an hour drive from our country home, so I was, >gulp< unemployed. A word I never thought I would be. I graduated on Deans List. 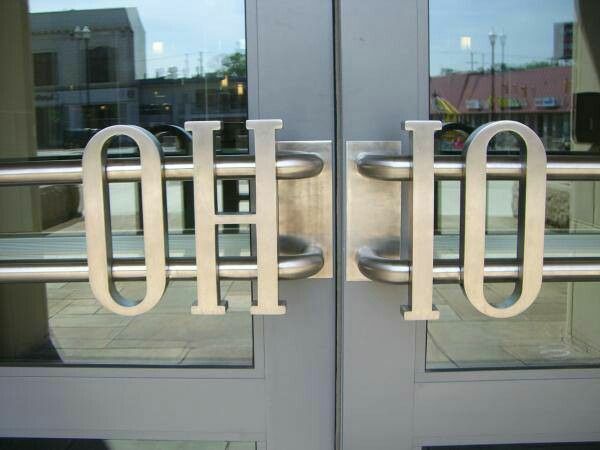 I had worked one job, if not two, since I was fifteen. Every day was hard. And it was for… oh, about five days. I could only apply for jobs so much without going crazy. I had no schedule. No need to get out of gym shorts. No need to turn off The Kardashian’s, even though I had already seen the episode four times. All of my friends were at least an hour away and, weird, at work. Like I should have been. I was pretty pathetic. I even remember one –bad– day wondering if I would ever work again. Then you realize you have spent a whole day and have not said one word aloud. Then you snap. And then, I opened the ice cream maker. I beamed to my mom on the phone about how easy and fun it was to make and how great it turned out. She must have beamed to her girlfriends about how wonderfully domesticated I was becoming (God knows she wasn’t talking about how great I was at my job…) because a couple weeks later I received a late wedding gift from one of her friends who lived in the neighborhood. 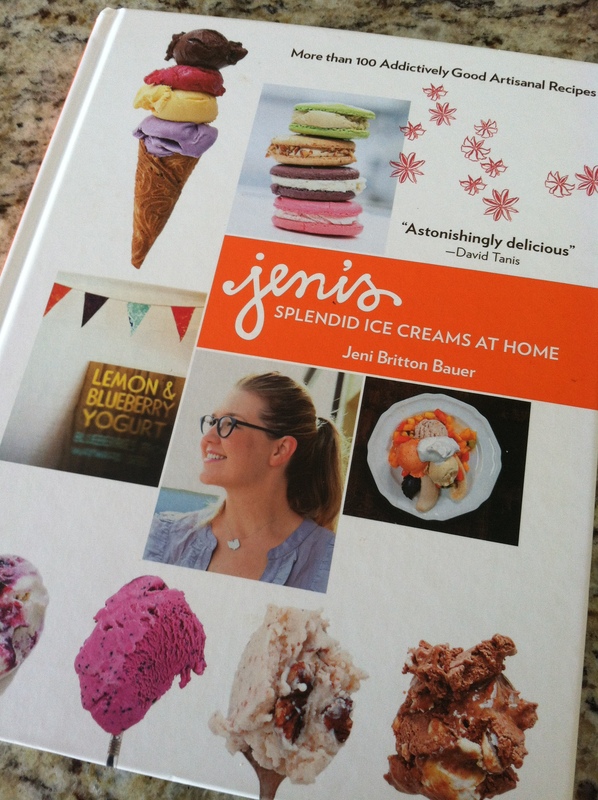 It was the, then very brand new, Jeni’s Splendid Ice Cream at Home Cookbook and a check with “For lots and lots of heavy cream!” in the memo. Jeni’s Ice Cream originated in my hometown of Columbus. She is now very well known for her unique flavors and fresh ingredients, but when she was just starting out years ago she had one shop (She now has multiple and is expanding like crazy out of Ohio) near my uncle’s house. He was a bachelor until he married a wonderful woman from England in 2008 and he would often take my little sister and me on “dates.” They were to neat places and are all so memorable. One time we wanted to try sushi, so he took us to his favorite sushi restaurant and ordered a BOAT of sushi for the three of us just so we could try a lot of different rolls. There were also dates to a trendy stone oven pizza place and even fancy steak houses. But one thing was always the same: the night ended with ice cream at Jeni’s. Jeni’s is a far cry from the typical vanilla. She uses crazy spices like lavender and cayenne. Sounds nuts, I know. But, it’s wonderful! As far as I know, Jeni’s was the first to create the flavor “Salty Carmel.” It was at Jeni’s that I learned I loved bourbon, even though I was well below the drinking age, with her bourbon butter pecan. The warmness of the bourbon mixed with the creamy ice cream and salty nuts. Divine. The cookbook is beautiful. Playful, rustic photos adorn the colorful pages. The recipes vary in difficulty. I will be honest; the ice creams can be difficult for novice cooks. I made the Salty Carmel ice cream when I got the book and was challenged. I felt like I had fifty things going on. My kitchen was MESS when it was all said and done. But, it was good, so I will still consider it a win. The sorbets are much simpler. I made her Watermelon and Lemonade Sorbet last summer and the hardest thing about it was cutting the watermelon. This got me thinking. I have fresh, organic peppermint in my backyard. And I was yet to use my ice cream maker this summer. Perhaps I should give it a try? Sure enough, it was in the cookbook so I made plans to get it going after work yesterday. 1. I feel like I am friends with Jeni after eating at her store for nearly a decade and before she made it big. It feels wrong to do it without her permission. 2. I am new to the blogging world and I am not real-life friends with Jeni. I am not sure what copyright laws are out there. And, 3. You should probably just go buy the book. You won’t regret it. The process of making the ice cream was pretty easy. 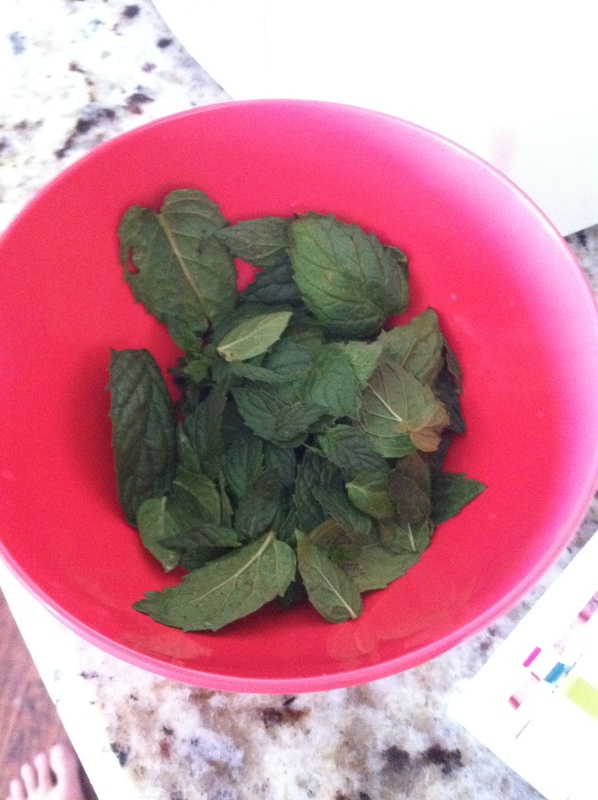 I loved tearing into my fresh mint leaves before adding them to the sugar cream mixture. They smelled so strong and vibrant. The mint needed to steep in the finished cream for at least four hours. I kept mine in the fridge for about six. 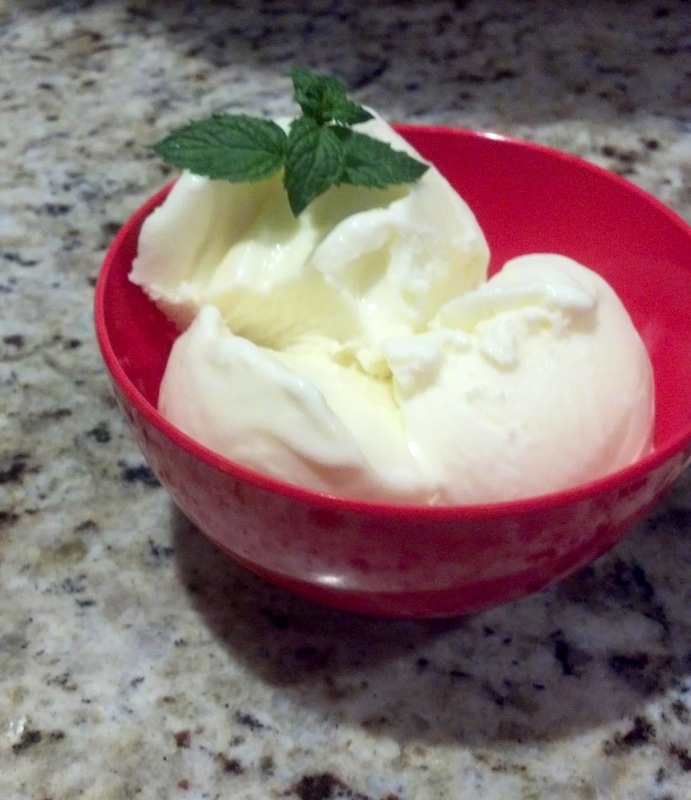 Before bed last night, I strained the mint leaves out, put the flavorful cream into the frozen ice cream bowl and let the machine spin for about fifteen minutes. 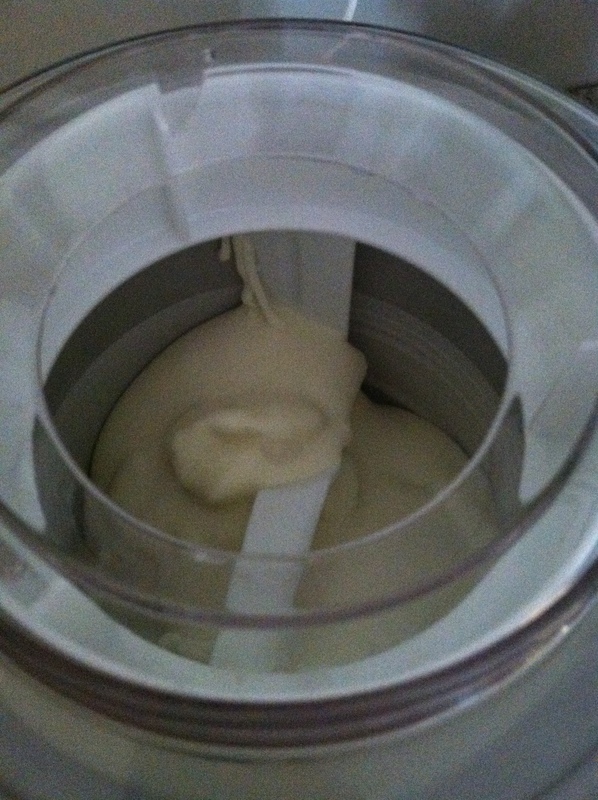 Then the mixture looked like ice cream and was pulling from the sides of the bowl. I slopped the finished product into a container and let it freeze until after dinner tonight. As Adam and I split the bowl, we both commented on how rich and creamy it was. 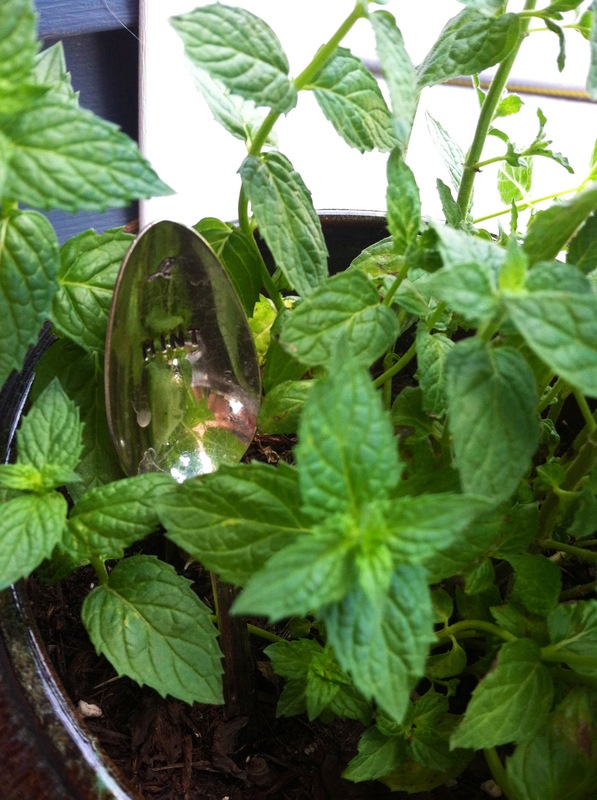 We loved the light, freshness of the mint.